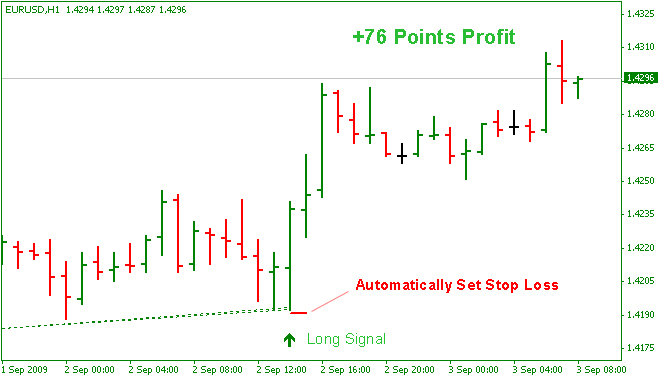 EXPLOSIVE Forex Indicator Generates Powerful Buy and Sell Signals! The Only Indicator to PREDICT Trend Reversals! 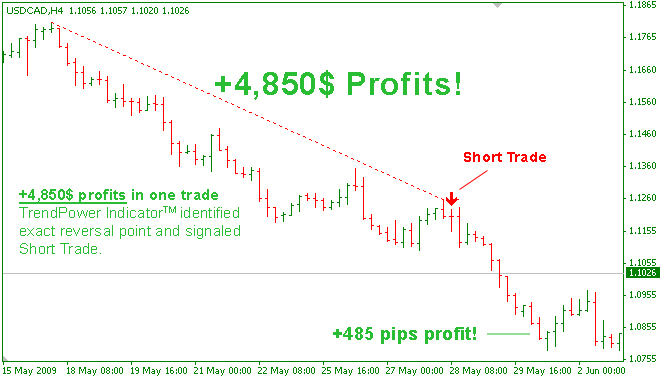 TrendLineX™ Indicator identified trend reversal, and won +485 pips in 1 trade! TrendLineX™ is so easy to use, you won't need any technical knowledge. 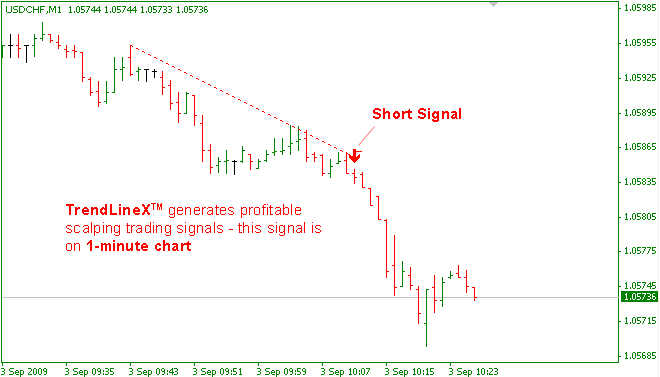 You don't need to read countless books on Technical Analysis or listen to Bloomberg for hours - simply follow the signals TrendLineX™ provides and you could be earning and profiting in FOREX in little or no time! Signals are simple to understand: Green arrow signals Long trade, Red arrow signals Short trade. 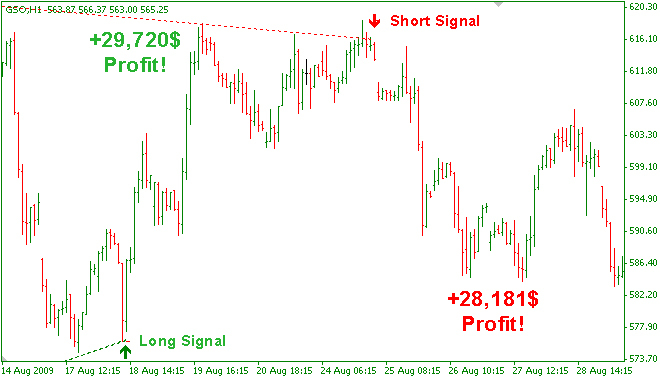 Stop loss is also showed for each signal - all this helps you read signals quickly and easily. You will not have to draw another line or another indicator in your entire life, because TrendLineX™ will do all the work for you. TrendLineX™ AUTOMATICALLY finds profit opportunities in the markets and alerts you as soon as they appear so you can take quick action. 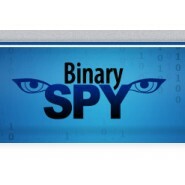 It will even tell you where to place your stop loss so your risk will be MINIMIZED! Trend lines are the main logic of the TrendLineX™. 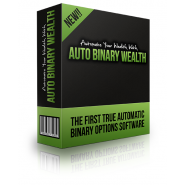 They are one of the strongest and most consistent technical analysis tools. They occured in the markets since the beginning of the 20th century and will continue forever. Considered a major part of the secret order at the markets, they are one of the few methods that predict trend reversals. TrendLineX™ is designed to automatically identify and take advantage of these profit opportunities. Unlike any other indicator, TrendLineX™ automatically provides you with Stop Loss location for ANY trade, so you will have iron-solid trades for maximum Risk:Reward. 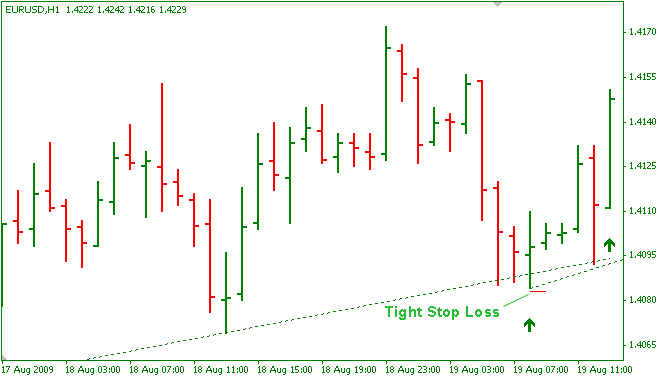 TrendLineX™ focuses on calculating a LOGICAL stop loss - not just few pips away from price - but a strong stop loss that maximizes the probability for profit while minimizing your risk. 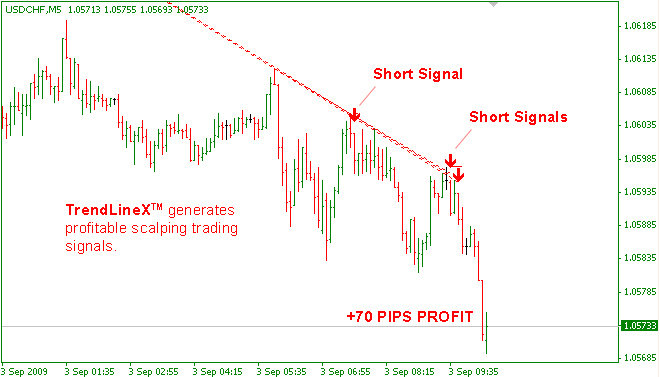 In a simple yet powerful method TrendLineX™ calculated stop loss, so you will have a tight stop loss for every trade you take - so your losses are minimal and profits are huge! Tight Stop Loss ensures minimal risk in trades and maximum yield! TrendLineX™ uses many filters and confirmation to provide you with only high-probabiliy trades. Our researchers devoted years to finding the right filters to maximize the potential and profits of these signals. 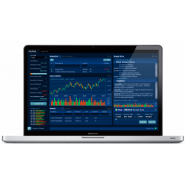 TrendLineX™ gives you the power of hundreds of years of trading - in the distance of a click. Trend confirmation ensures that you will always have the power of the trend on your side. Plus, TrendLineX™ will check that the market has volatility so you will not enter a sleepy market. Much research has been invested in TrendLineX™, to make it the best trading indicator ever. TrendLineX does not repaint or change its signals - every buy and sell signal and iron-solid and once produced will not disappear. TrendLineX™ is unlike any other indicator. 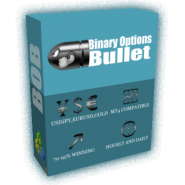 Because it is based on price action, it works on any FOREX pair, commodity or Stock! The trading logic behind happens in every market, allowing to enjoy an endless stream of trading opportunities. 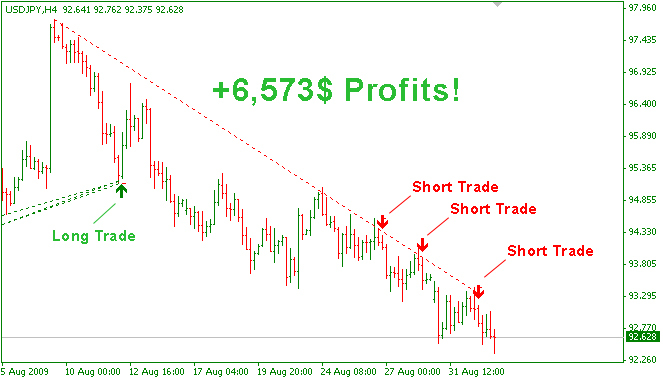 TrendLineX™ generated 57,901$ of Profits trading the OIL - in 10 days! Note that all these enormous profits occured at THIS MONTH ALONE! 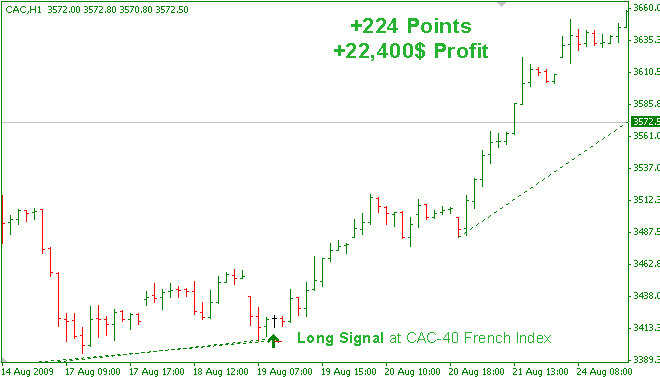 Were you trading this indicator only at August, you would be gained over 80,301$ in the OIL and CAC40 Trading alone - and don't forget that you are trading it on FOREX as well! Trendlines occur in any time frame, so even if you are a scalper or a swing trader, you will have strong buy/sell signals with TrendLineX™ indicator. Trend lines appear in any timeframe and TrendLineX™ can trade all of them. TrendLineX™ generates profitable trading signals in any timeframe - even for scalpers! TrendLineX™ trading signals acheive high accuracy rate - 80% profitable trades! Such high accuracy is unprecedent and unachieveable by any other indicator.